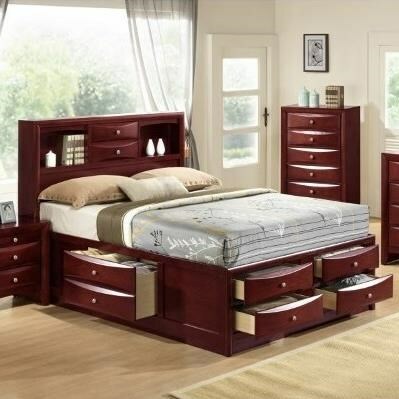 This beautiful captain's bed has built-in storage essential for any master or guest room. Organize bedding or linens with the deep drawers along the rails of each side while the footboard has four drawers ideal for folded clothing. Make the most of your space and create a room that is neat and organized while still being stylish. Drawer exteriors feature dramatic beveled fronts and small silver finished hardware. Let this captain's bed completely transform a bedroom in your home while allowing you to make the most of every inch space. The Emily Queen Captain's Bed with Bookcase Headboard by Crown Mark at Del Sol Furniture in the Phoenix, Glendale, Tempe, Scottsdale, Avondale, Peoria, Goodyear, Litchfield, Arizona area. Product availability may vary. Contact us for the most current availability on this product. Finish Each piece of furniture is handcrafted using imported Asian hardwood and veneers. Beautiful dark brown finish is accented with silver knobs. Handles & Hardware Silver finished solid metal knob hardware. Case Detail Tapered post legs finish each piece for a contemporary look and feel. Drawer / Shelf Construction Drawer exteriors feature dramatic beveled fronts. English and French dovetailing to maximize storage capacity and strength. Drawers also feature ball-bearing glide components. Description: Top Smooth, unframed tops contribute to the contemporary style of each piece. Case Construction The collection uses a combination of selected hardwood and softwood solids, veneers and wood and/or simulated wood products. Cases feature sleek, contemporary lines, dramatic beveled drawer fronts and a warm dark brown finish. The Emily collection is a great option if you are looking for Transitional furniture in the Phoenix, Glendale, Tempe, Scottsdale, Avondale, Peoria, Goodyear, Litchfield, Arizona area.